Place flour, baking powder and salt into a bowl. Stir to combine and set aside. Place cocoa powder, granulated sugar and oil into a medium sized bowl or the bowl of a standing mixer. Mix to combine. Add eggs one at a time, mixing until each is fully incorporated. Mix in vanilla. Stir in flour mixture until just combined. Be careful not to overmix. Cover cookie dough with plastic wrap and place in freezer to chill for at least 1 hour or 2 hours in the fridge. **Dough can be prepared in advanced and placed in the fridge overnight. Using a small ice cream scoop or a spoon, scoop out dough. Roll dough into small balls and coat generously with confections sugar. Place dough balls an inch apart onto prepared baking sheet. Bake for 10 to 12 minutes. Remove cookies from oven and transfer them onto a cooling rack to cool completely. 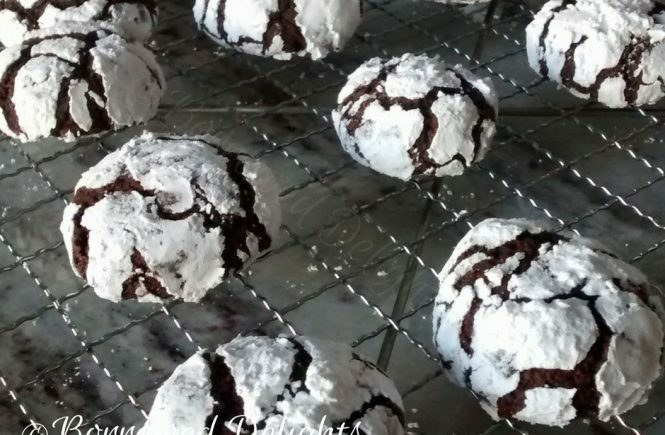 Variations: Intensify these Chocolate Crinkle Cookies by simply replacing the vanilla extract with almond, cherry, rum, mint or the extract of your choice.